Soured milk denotes a range of food products produced by the acidification of milk. Acidification, which gives the milk a tart taste, is achieved either through bacterial fermentation or through the addition of an acid, such as lemon juice or vinegar. The acid causes milk to coagulate and thicken, inhibiting the growth of harmful bacteria and improving the product's shelf life. Soured milk that is produced by bacterial fermentation is more specifically called fermented milk or cultured milk. Traditionally, soured milk was simply fresh milk that was left to ferment and sour by keeping it in a warm place for a day, often near a stove. Modern commercial soured milk may differ from milk that has become sour naturally. Soured milk that is produced by the addition of an acid, with or without the addition of microbial organisms, is more specifically called acidified milk. In the United States, acids used to manufacture acidified milk include acetic acid (commonly found in vinegar), adipic acid, citric acid (commonly found in lemon juice), fumaric acid, glucono-delta-lactone, hydrochloric acid, lactic acid, malic acid, phosphoric acid, succinic acid, and tartaric acid. Soured milk is commonly made at home or is sold and consumed in Europe, especially in Eastern Europe (Bulgaria, Belarus, Poland, Slovakia, Russia, Ukraine), all over the countries of the former Yugoslavia (Macedonia, Serbia, Montenegro, Bosnia and Herzegovina, Croatia, Slovenia), Romania, Greece, Finland, Germany, and Scandinavia. It is also made at home or sold in supermarkets and consumed in the Great Lakes region of Somalia and Eastern Africa (Kenya, Uganda, Rwanda, Burundi and Tanzania). It is also a traditional food of the Bantu people of Southern Africa. Since the 1970s, some producers have used chemical acidification in place of biological agents. Raw milk that has not gone sour is sometimes referred to as "sweet milk", because it contains the sugar lactose. Fermentation converts the lactose to lactic acid, which has a sour flavor. 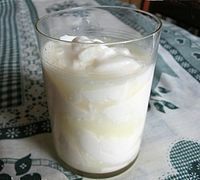 Before the invention of refrigeration, raw milk commonly became sour before it could be consumed, and various recipes incorporate such leftover milk as an ingredient. Sour milk produced by fermentation differs in flavor from that produced by acidification, because the acids commonly added in commercial manufacture have different flavors from lactic acid, and also because fermentation can introduce new flavors. Modern food safety standards mean that milk that has gone sour is not considered safe to drink. Buttermilk is a common modern substitute for naturally soured milk. ^ a b "TITLE 21--FOOD AND DRUGS: CHAPTER I, PART 131 MILK AND CREAM". Electronic Code of Federal Regulations (e-CFR). 2007-04-01. Retrieved 2007-11-18. ^ Nakamura, Yasunori; Naoyuki Yamamoto; Kumi Sakai; Toshiaki Takano (June 1, 1995). "Antihypertensive Effect of Sour Milk and Peptides Isolated from It That are Inhibitors to Angiotensin I-Converting Enzyme" (PDF). Journal of Dairy Science. 78 (6): 1253–7. doi:10.3168/jds.S0022-0302(95)76745-5. PMID 7673515. Retrieved 2007-06-30. ^ Sukhov, SV; Kalamkarova LI; Il'chenko LA; Zhangabylov AK (1986). "Microfloral changes in the small and large intestines of chronic enteritis patients on diet therapy including sour milk products". Voprosy pitaniia (in Russian). Jul-Aug (4): 14–7. PMID 3765530. ^ Ochs, Carol (October 3, 2017). "Consequences of Drinking Expired Milk". Livestrong.com. Retrieved 2018-09-10. This page was last edited on 23 February 2019, at 01:53 (UTC).